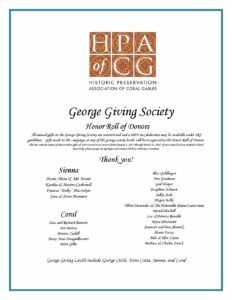 In the spirit of philanthropy, the Board of Directors of the Historic Preservation Association of Coral Gables invited friends and benefactors in the George Giving Society—a giving society within the annual fund campaign that supports historic preservation and its’ resources. 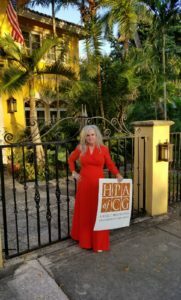 The by-invitation-only event was at the elegant home of Coral Gables residents and HPACG members Elizabeth and Filippo Ghia. Guests sipped champagne and enjoyed the impeccably decorated interior by Elizabeth Ghia, who is the selected designer of the Grand Salon in the 2018 Junior League of Miami Show House at the Deering Estate. Details of the home are many, but a few favorites are the terracotta stone fireplace, the stained glass interior panels, and the colorful tiled stairway that leads to a cozy space overlooking the living room. The afternoon turned into a kaleidoscope of colors as bursts of orange and yellow peered through the windows and permeated the décor as dusk would have to wait– for daylight lingered an extra hour. Attending the event included present and former HPACG board members Lisa Bennett, Karelia Martinez Carbonell and her husband Dr. Marino Carbonell; Ann Goodman, Jane Maranos, and Mary Anne Danguillecourt. Other guests included Josephine Johnson, Brett Gillis, Albert Menendez and his wife the Honorable Maria Santovenia, Aida and Eleo Zayas, Raquel Hickey, and former Mayor Don Slesnick and his wife Commissioner Jeannett Slesnick.